This piece appears in our Fall 2018 issue. Subscribe to receive a copy of this issue in your mailbox. BASSEM TAMIMI wants a Third Intifada. He does not want it to be anything like the Second Intifada, in which the Palestinian resistance drifted from its commitment to nonviolence. Instead, he has long sought a return to what’s known as the popular resistance of the First Intifada, characterized by labor strikes, boycotts, and demonstrations that touched every part of Palestinian civil society. Nabi Saleh is a small village of a few hundred outside the West Bank’s political and commercial capital, Ramallah. In spite of its size, the community, and the Tamimi family, are among the most well-known Palestinians in the world. Beginning in 2009, the Tamimi family started holding weekly protests, aiming to call attention to the theft of Palestinian land and water by an adjacent religious Jewish settlement, Halamish, while demonstrating to Palestinians, and to the world, what popular resistance should look like. The family rigorously documented the Israeli military presence in Nabi Saleh and was regularly photographed alongside human rights activists, journalists, and other demonstrators. After initially rising to prominence because of their decade of protest in Nabi Saleh, the Tamimis achieved even wider recognition after Tamimi’s teenage daughter Ahed was arrested in the middle of the night last December. It appeared to be an act of retribution on the part of the Israeli government after a video of Ahed went viral, depicting her slapping an Israeli soldier outside her family’s home. Ahed was sentenced to eight months in prison, which she served alongside her mother Nariman, who had been booked on related charges. Both were released in late July. The protests in Nabi Saleh and other Palestinian communities like Bil’in, Kafr Qaddum, and Hebron succeeded in drawing attention. A 2013 New York Times Magazine article by the journalist Ben Ehrenreich asked, “Is This Where the Third Intifada Will Start?,” and the Tamimi family became a household name in Israel, termed by critics a “propaganda machine” for the Palestinian cause. As evidence of their infamy in Israeli society, at one point in the first season of the hit Netflix show Fauda, about undercover Israeli operatives in the West Bank, an Israeli agent auditioning for a Hamas suicide bombing mission claims to be a Tamimi from Nabi Saleh. This notoriety has further curdled into paranoia: this past January, an Israeli government minister acknowledged to Haaretz the existence of a secret probe into whether the “light-skinned” Ahed was really her father’s daughter, or just an actor playing a part. For the past 30 years, Tamimi and like-minded activists have committed to a vision of popular resistance, using tactics drawn from the playbook of the American civil rights movement, which they believe is the most effective strategy to end the occupation. But the protests themselves, once weekly occurrences, have become sparser over the last decade, as they have been met with increasing brutality. Hundreds of protesters have been wounded by the Israel Defense Forces and Border Police, much of the Tamimi family (which dominates Nabi Saleh) has been arrested and imprisoned at one point or another, and many have been crippled or even killed. And while such village protests, in Nabi Saleh and elsewhere in the West Bank, have forced Israel to reroute its “security wall” or delay demolitions of Palestinian homes, they are no closer to ending the occupation at large, which has only become further entrenched by expanding Israeli settlements and continuing American support. Palestinian activists today face an urgent question: How can they mobilize a critical mass of Palestinians and activists abroad toward a third, nonviolent Intifada? OVER THE PAST FEW DECADES, the nature of what it means for Palestinians to resist an ever-expanding, 51-year occupation has changed greatly. As described by Mary Elizabeth King in her comprehensive history, A Quiet Revolution: The First Palestinian Intifada and Nonviolent Resistance, traditional mass political organizing developed in tandem with a strategy of armed resistance led by the Palestine Liberation Organization (PLO) throughout the 1970s and 80s, laying the foundation for the First Intifada. During that Intifada, which began in late 1987 and ended in 1993 with the Oslo Accords, Palestinians adopted what King identifies as “classic nonviolent methods.” Local Palestinian leadership and the Unified National Command coordinated boycotts of Israel and a collectivization of social services to protect themselves from Israeli backlash and allow as many Palestinians as possible to protest; one village, Beit Sahour, created its own secret dairy farm to help sustain the boycott. Women, in particular, played a pivotal part, organizing protests and committees, and taking leadership roles in the nascent resistance. During this time, the Tamimi family worked as activists, organizing protests and channeling the resistance in Nabi Saleh. Tamimi himself was imprisoned twice during the First Intifada at the then newly opened Ofer prison complex in the West Bank, the same place where Ahed stood trial 30 years later. As King shows, this organized nonviolence was the driving force of the Intifada: of 90 appeals issued by the Palestinian leadership at the time, fewer than 10% were invocations to throw stones or gasoline-filled bottles. The late Gene Sharp, a respected scholar and advocate of nonviolent movements, wrote in 1989 that “the 15 percent or so of the uprising that is constituted by low-level violence involves chiefly stone throwing.” In 1988, buoyed by popular global support for the resistance, Yasser Arafat went to the United Nations and officially backed a two-state solution, paving the way for peace talks with Israel. The Palestinians had taken meaningful first steps toward the end of Israeli control over Gaza and the West Bank, and those initial peace talks gave way to the Oslo Accords, signed in 1993. But almost immediately, things began to break down. The toll incurred by the First Intifada was not insubstantial: according to the human rights group B’Tselem, 1,204 Palestinians and 179 Israelis were killed. In 1994, less than a year after the Oslo Accords were announced, Jewish extremist Baruch Goldstein massacred 29 Palestinian worshippers at an Islamic holy site in Hebron. Yitzhak Rabin was assassinated in 1995. And Palestinian Islamists like Hamas were steadily acquiring power. Meanwhile, the number of settlers in the West Bank alone more than doubled between 1990 and 2000, reaching nearly 200,000 (it is now more than twice that figure). With the collapse of talks at Camp David in 2000 and Hamas’ rising hardline influence forcing the PLO’s hand, nonviolence advocates like Tamimi argue that the Palestinians made a substantial tactical error: the Second Intifada. As Tamimi puts it, by pursuing more violent forms of resistance during the Second Intifada, such as suicide bombing, extremists in both Palestine and Israel were emboldened, and the Israeli occupation deepened. Critically, Palestinians lost ground in the fight to be seen worldwide as the obviously oppressed, and rising pro-Israel sentiment in American politics limited the pressure applied on Israel by its patron state. “They portrayed us as ISIS, Al Qaeda. We did suicide bombings, that was our mistake, we can’t do that anymore,” Tamimi said. According to testimonies collected by the group Breaking the Silence, Israeli soldiers who served in Nabi Saleh understood their roles to be more than just preventing terrorist attacks on Israeli or settlement soil. THE ISRAELI MILITARY is not the only thing standing in the way of a popular Palestinian uprising. Though Tamimi hesitates to say it explicitly, Fatah, the party in control of the PA, and the Palestinian Authority have little interest in anything like the mass civil disobedience of the First Intifada, a paradoxical consequence of the “victories” won by Palestinians at the Oslo negotiating table. “Oslo brought about a series of changes that collectively make the [kind of] uprising that you had from 1987 forward extremely difficult,” says Nathan Thrall, an analyst at the International Crisis Group and author of the book, The Only Language They Understand: Forcing Compromise in Israel and Palestine. As part of the Accords, the PA assumed responsibilities of governance and police authority over large swaths of Palestinian territory. But the PA is still subordinate to Israeli military authorities, and to stay in its good graces it is essential for the PA to suppress First Intifada-style resistance. (With the signing of Oslo, the idea was that Palestinians would instead gain their freedom through American-mediated negotiation with Israelis.) In effect, this means that Israel has outsourced much of the administration of occupation to Palestinians themselves. The bulk of this outsourcing is in the form of Palestinian security forces—which serve, in part, to prevent Hamas from ever taking power and to suppress internal dissent—and in employment: roughly a third of West Bank households are supported by a family member drawing a PA paycheck, and a further 35,000 are employed by the PA in Gaza. 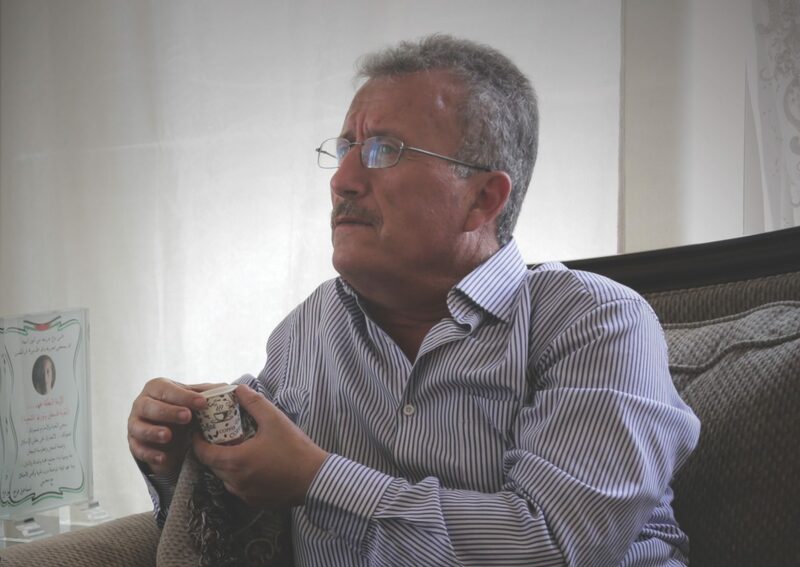 The status-quo that has taken root is what Palestinian businessman Sam Bahour has sardonically referred to as a “five star occupation.” In Gaza, Palestinians endure electricity shortages, a contaminated water supply, and cyclical, deadly clashes with the Israeli military. And in more rural parts of the West Bank, Palestinians and Bedouin suffer land seizures, substantial limits to movement, and settler violence. But for much of Palestinian society, particularly in larger cities, life under occupation is restricted and impoverished, but stable. IN THE PAST YEAR, I have visited the Tamimi family twice: once this past December, shortly after Ahed’s arrest, and again in late August. In that time, Ahed was sentenced and released from prison, the US embassy was installed in Jerusalem, and over a thousand Palestinian protesters were shot by Israeli soldiers at a nonviolent protest along the Gaza border. The week after my last visit, the US cut $350 million worth of annual aid to UNRWA, the UN agency charged with supplying critical social services to over five million Palestinians in both the West Bank and Gaza. On the ground, for the Tamimis and many other Palestinians, the occupation has not changed, Tamimi stressed. Before my visit in August, Ahed’s older brother Waed was sentenced to 14 months in prison for throwing stones, which many see as further retribution against the family. Still, life appears to have taken on a somewhat greater sense of normalcy since Ahed and Nariman’s release. The family home had been renovated and expanded by August, and Tamimi met us after returning from a trip to nearby Ramallah. A shinier and tidier set of plaques and photos, honoring the Tamimis’ protests or depicting their meetings with politicians from Palestine and abroad, has replaced the scruffy posters and pictures that were on the living room walls in December. A PALESTINIAN JOURNALIST, Alaa Daraghme, accompanied me to Nabi Saleh. On the way back to Ramallah, where we sipped beer at an outside bar tucked in the shade, Daraghme politely suggested that Tamimi had a few things wrong. “The new generation is tired—people just want to build a life,” he said. Having freelanced for the BBC and Al Jazeera, and attended many of the protests which Tamimi cites as an example of what resistance can look like, he simply doesn’t see the necessary commitment in Palestinian society. After the failures of Oslo and declining solidarity from other Arab countries (some of whom have developed quiet alliances with Israel against Iran), the capacity for resistance has been diminished. While occasionally there might be something that draws attention, like Ahed’s arrest, Daraghme feels that activist energy has continued to dissipate, particularly with recent PA crackdowns on any West Bank protest that could be seen as critical of Abbas. And yet, the political dynamics that support this status quo are rapidly shifting. The Trump administration’s embassy move and cuts to Palestinian aid further isolate the PA, whose strength is wrapped up in its support from Israel and foreign countries. Abbas, who is in his 80s, has no obvious successor, and his replacement will likely have to suspend elections in order to prevent the possibility of Hamas taking control, undermining Fatah’s claim on legitimacy. In Israel, Prime Minister Bibi Netanyahu has yielded more and more ground to his right wing. His support for cutting American aid to UNRWA and the passage of the recent “nation-state” bill opposed the wishes of the Israeli military leadership, which is the Israeli government’s greatest advocate for “stability” in Palestinian territories. The impact of this deterioration, Tamimi hopes, may amount to a change in the facts on the ground, and allow a popular uprising to flourish.